Historically, and through the June 2019 test administration, the LSAT has been a paper-and-pencil test. Beginning in July 2019, however, half of test takers will take their exams on paper, while the other half will take the LSAT digitally on a Microsoft Surface Go tablet. By September 2019, ALL LSATs administered in the United States and Canada will be digital, administered on a tablet. The July 15, 2019 LSAT administration will be unique in several key respects. First, students who sign up for this test administration will not know in advance whether they will be taking the paper-and-pencil test or the digital test. Some locations will administer the paper test, and others the digital test. The test content will be the same regardless. Acknowledging the additional strain that this may place on the July 15, 2019 test takers, LSAC has announced that July 2019 takers will have the opportunity to see their LSAT score and five days to decide whether they wish to cancel it (a canceled score will be reported to law schools as a "candidate cancel"). Those who do decide to cancel will have the option of retaking the LSAT one time free of charge in the 2019-2020 testing cycle (which extends through April 2020). More details about these options will be made available when LSAC opens registration for the July 2019 test. Tablets will be provided to test takers at the test center. On the digital LSAT, both the content and the structure of the test sections and the questions will be the same as the paper-and-pencil LSAT. 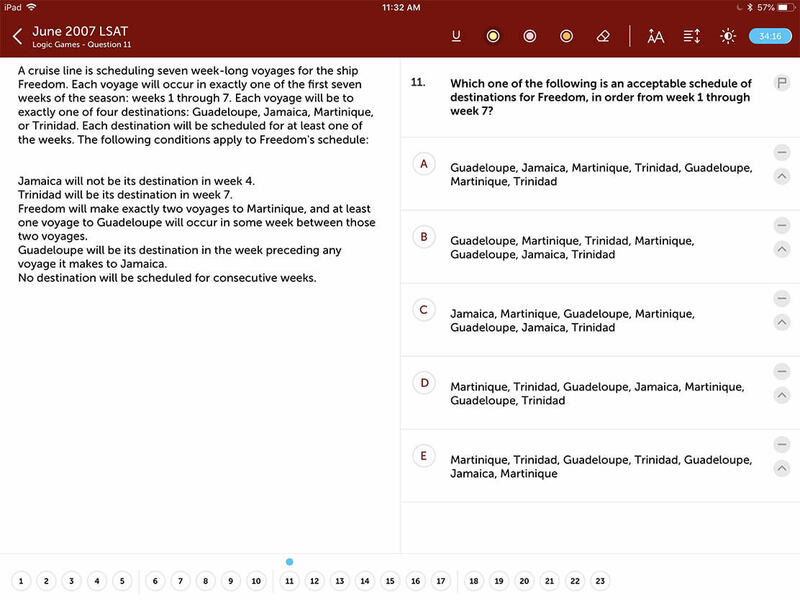 But in addition, the digital LSAT will include new features such as a timer with a five-minute warning, highlighting, and flagging to keep track of questions that you may want to revisit in a section. While this is undoubtedly the biggest change in history of the LSAT, tablet-based LSATs are nothing new for LSATMax. We have been offering full-length, officially licensed LSATs on both iPads and Android tablets since 2012, so you can rest assured that our 5-star rated app will allow you to simulate the new tablet-based LSAT experience to a t.
Still concerned? Schedule a call with one of our LSAT-experts. They will be able to answer any additional questions and/or concerns you may have about this transition.